I need these. I’m very likely going to need a lot more. Home Depot doesn’t have them. Lowes doesn’t have them. They both have, unexplainably, #6 finishing washers. I guess you could use flat head screws with them. But what do they carry other oval head options for? They’re sheet metal screws by name, so they aren’t made to be countersunk. There are lots of options for music if you want the most popular stuff. Those choices are typically produced to be the most profitable in the short term: The songs are written to be immediately “sticky”, not for lasting relevancy. Catchy hooks are formulaic, anyone can learn to write them reliably. The major labels carry a handful of products by a handful of creators. Why carry specialty products? If you want real variety, and more chances of finding the quality you want, remember that every purchase is a vote for more. 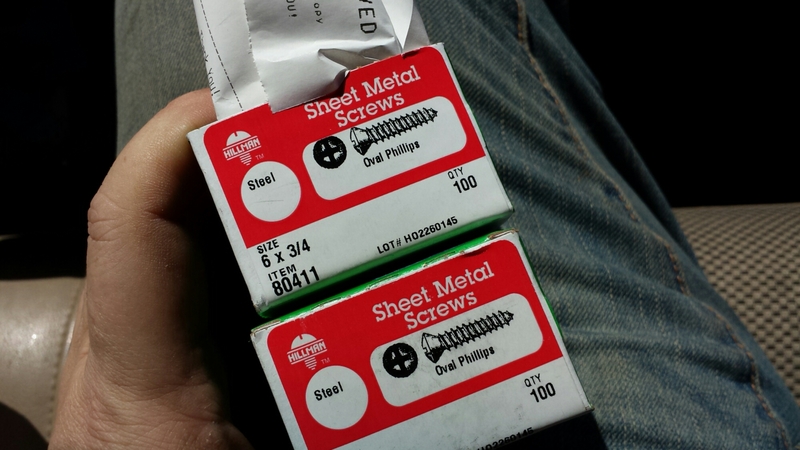 I bought the screws at Lowry Hardware, 975 W Prince Rd, Tucson, AZ 85705. Their sign brands them as a True Value, but they must have lapsed on their franchise fees or something. I don’t know how our project would have come as far as it has without Grant Road Lumber, also True Value, and possibly the last real lumber yard in town. They just went out of business.